Launch effective real-time communications to win in today's always-on world Gone are the days when you could plan out your marketing and public relations programs well in advance and release them on your timetable. "Real time" means news breaks over minutes, not days. It means companies develop (or refine) products or services instantly, based on feedback from customers or events in the marketplace. And it's when businesses see an opportunity and are the first to act on it. 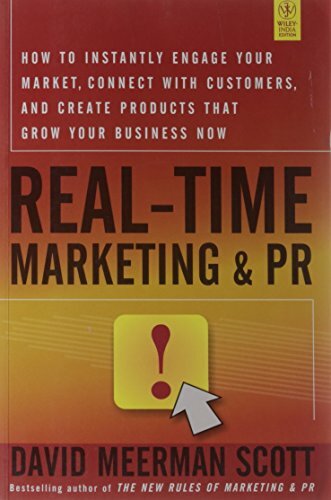 In this eye-opening follow-up to The New Rules of Marketing and PR, a BusinessWeek bestseller, David Meerman Scott reveals the proven, practical steps to take your business into the real-time era. Find out how to act and react flexibly as events occur, position your brand in the always-on world of the Web, and avoid embarrassing mistakes and missteps. Real-Time Marketing and PR will also enable you to: * Develop a business culture that encourages speed over sloth * Read buying signals as people interact with your online information * Crowdsource product development, naming, and even marketing materials such as online videos * Engage reporters to shape stories as they are being written * Command premium prices by delivering products at speed * Deploy technology to listen in on millions of online discussions and instantly engage with customers and buyers Scale and media buying power are no longer a decisive advantage. What counts today is speed and agility. While your competitors scramble to adjust, you can seize the initiative, open new channels, and grow your brand. Master Real-Time Marketing and PR today and become the first to act, the first to respond, and the first to win! "With his acute ear for the cash register and his journalist's sense of urgency, no one understands the value of time better than David Meerman Scott. He teaches marketers and C-level execs how to use time and urgency to gain huge competitive advantage. 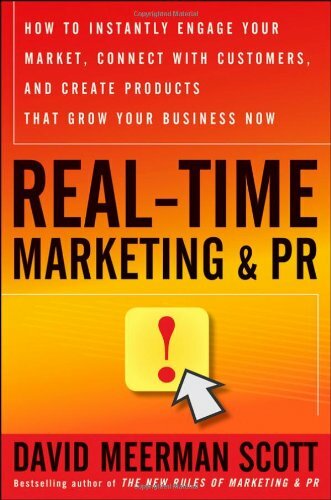 Read Real-Time Marketing and PR. Make money while your competitors sleep." "If you are not hooked (hook, line, and sinker) within ten minutes of starting David Meerman Scott's wonderful new book, well, I fear for you. Beautifully written cases that reach out from the page and grab you and shake you—and practical advice that anyone, anywhere can use in a flash to make hay. I simply loved this book, and doubled my knowledge along the way." "Information is like running water. The speed of information as it cascades through digital channels has been dramatically accelerated and amplified, requiring marketing to change in order to catch up to this new reality. 'Real time' is the keyword." Gone are the days when you could execute marketing and public relations programs on your own timetable. "Real time" means news breaks over minutes, not days. It means companies use feedback from the marketplace to develop (or refine) products or services instantly. And it's when businesses see an opportunity and seize it, before anyone else. 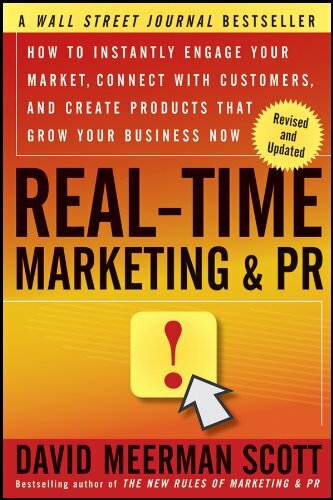 In this eye-opening follow-up to The New Rules of Marketing and PR, David Meerman Scott reveals the proven, practical steps to take your business into the real-time era.